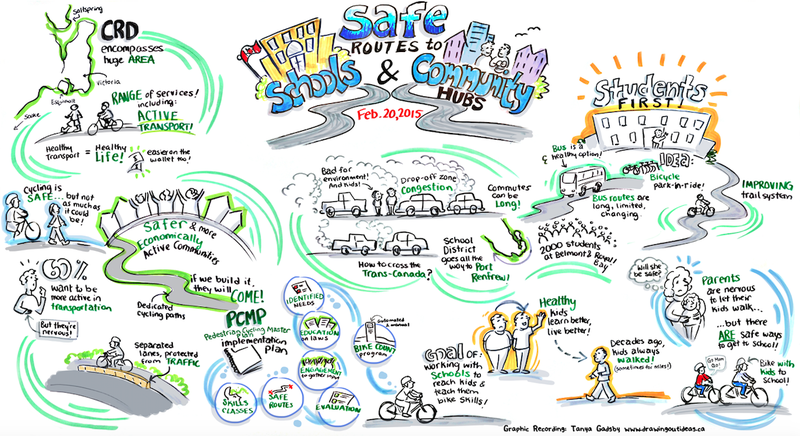 West Shore Parks and Recreation’s hosted the Safe Routes to School & Community Hubs Active Transportation forum on Feb 20th, 2015. Active and Safe Routes to School is a constellation of the Child & Youth Health Network~. Regional: Support programs that focus on behaviour change. Partner with Parks to connect trail routes to schools. West Shore: Complete rail trails system. Promote existing trails to get to school. Encourage more conversation between Municipalities and SD62. North Saanich: Increase communication and partnership between Municipalities, SD and Bike Advocacy groups. (Crossing guards, new schools, cycling programs). Saanich: Create Active Transportation Master Plan and begin Safe Routes to School Program in Fall 2015. Partner with Community stakeholders to promote. Find more information about the forum here.